Gymnastics Unlimited hosts Scout events for Girl Scouts, Boy Scouts, and other youth groups looking to organize fun, healthy physical events. Our gym includes stations and equipment like the spring floor, trampoline, tumbl-trak, foam pit, rock wall, ninja area, inflatable bounce castle, and more. Scout events last one hour and cost $10 a child. Each Scout must arrive with a signed event waiver form in order to participate. At least two Scout leaders or co-leaders must be present. Our experienced and safety-certified coaches oversee the event and all its stations. 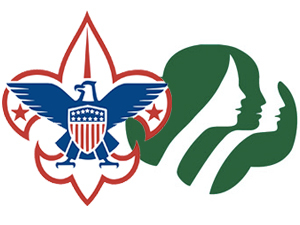 If you intend to make this a chance for Scouts to earn a badge, Scout leaders should let us know what the requirements for the badge are ahead of time. Our head coaches will structure the event so the Scouts can meet all of the badge’s requirements by the time it is over. To choose a time, click the link below and book the event during one of the available (green) “birthday party” time slots. Please note that most time slots are on Saturday afternoons. Photos from the All School Meet are now available on our website!